Winter is officially here. It's the season of long nights and short days, of reflection and looking inward, and of thinking of ways to keep warm: scarves, gloves, fireplaces, cuddling... and warm food. Winter brings with it some icy, snowy, and gray days. At this point, you don’t want to do anything but stay in and curl up in a blanket with a nice bowl of warm food. Temperatures are dropping, which means that it’s the perfect time to heat things up with a warm bowl of soup. A piping hot bowl of soup is the ultimate comfort food during the winter months. Soup doesn’t have to be rich and creamy to be satisfying, though. Today i finally welcomed the approaching Winters in my home with my homemade winter warmth.This light, healthy broth has an absolute fuss-free recipe and is loaded with goodness of nutritious veggies! 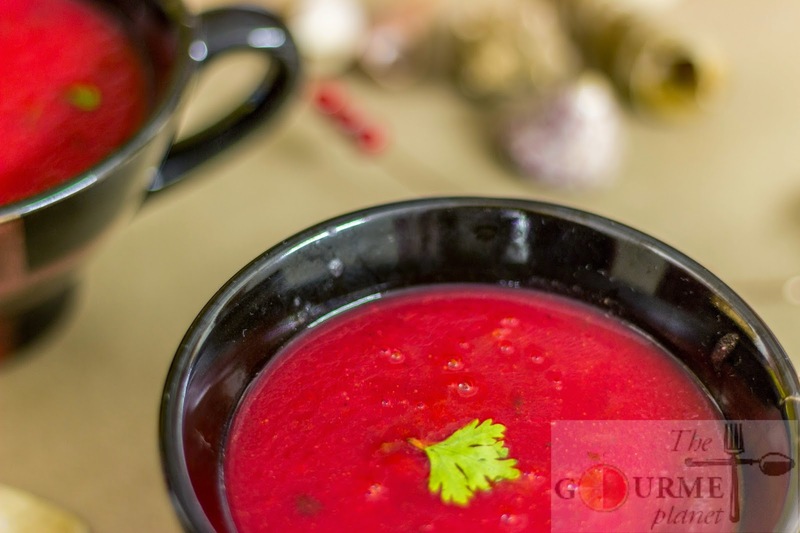 The sweet earthiness of the beet grounds the subtle notes of the tomatoes and carrots, adding depth without overpowering the flavor but renders a lovely valentine red color to the soup. If the world seems cold to you, kindle fires to warm it with my version of "good-for-you" soup. 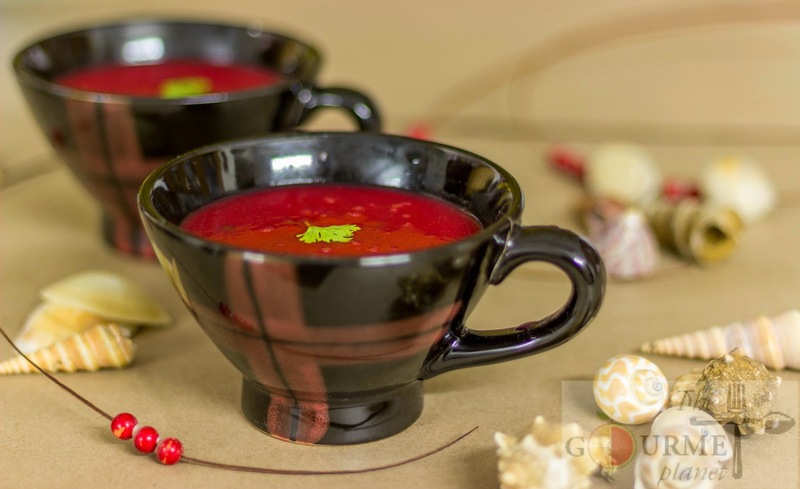 This soup is brimming with beautiful colors and flavors that boost your immunities through the cold and flu season. A hearty bowl of warm soup on a cold day makes winter seem worth it, Isn't it? NOTE: Do not throw away the water. You will need it in the last stage of cooking the soup. 3. Let the sieved vegetables cool down for sometime and then blend in a mixer. 4. Strain this through a metal strainer to remove the seeds and any tomato skin left. NOTE: Use the same water which was sieved initially. 6. Heat a wok and add butter to it. 8. Pour in the soup and some coriander leaves and let it boil for 3-4 minutes. Boil until water and soup do not appear as separated in the mix. 9. Season generously with black pepper, adjust salt and add sugar. 10. Stir and give a final boil and transfer in individual soup mugs. 11. 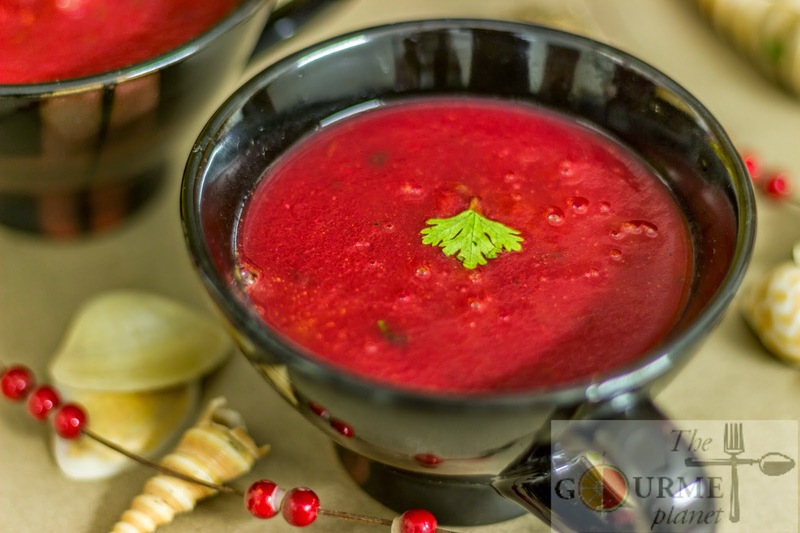 Garnish with coriander leaves and serve piping hot! Savor this warm thin, light soup while snuggled under layers of cozy blankets. Have a comfortable winter night!